A cyclist cheers as he reaches the finish line in one of the stages in the first edition of Tour of Antalya in 2018. This year's event will bring together cyclists from 21 countries. Cycling teams from 21 countries will arrive in Antalya next week to attend the Tour of Antalya. The season-opening event offers cyclists a scenic route in the Mediterranean city, which is among the world's most popular tourists destinations. Ahead of the tour, scheduled between Feb. 21 and Feb. 24, event director Aydın Ayhan Güney said all preparations were in place. "We are pleased to receive applications from more than 100 teams from around the world in the second year of the Tour of Antalya. The four-stage tour covers a route of about 500 kilometers, Güney told the Demirören News Agency. He added that they did "minor changes" to three stages "to keep the event and cyclists more dynamic." "The success of last year's edition increased the demand for the event classified as 2.2, [or one day race] by the Union Cycliste Internationale [the world's governing body of cycling]," added Güney. Twenty-eight teams were chosen among the dozens of applicants and 168 cyclists will now compete. The event also hosts four Turkish teams. The last day of the tournament will host Gran Fondo, a race open for professional and amateur cyclists. A 4-kilometer ride will raise awareness on cycling, whose popularity has recently skyrocketed in Turkey, will also be held on the last day of the event in downtown Antalya. Erol Küçükbakırcı, head of the Turkish Cycling Federation, says the event will also serve the purpose of promoting the beauty of Antalya to millions around the world. 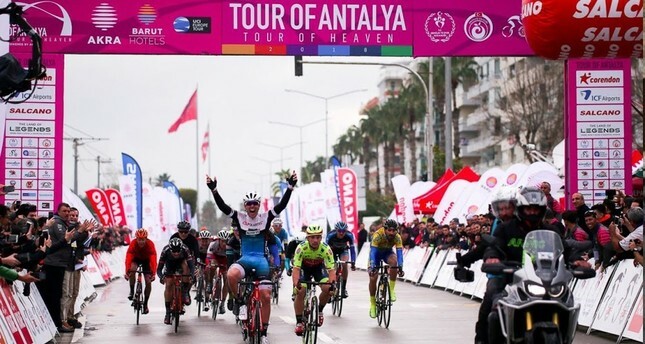 Speaking to İhlas News Agency, Küçükbakırcı said the Tour of Antalya was the second most important cycling event after Presidential Cycling Tour of Turkey, which is held in April. "We want to make it as known as the Tour de France and other similar events," Küçükbakırcı said.